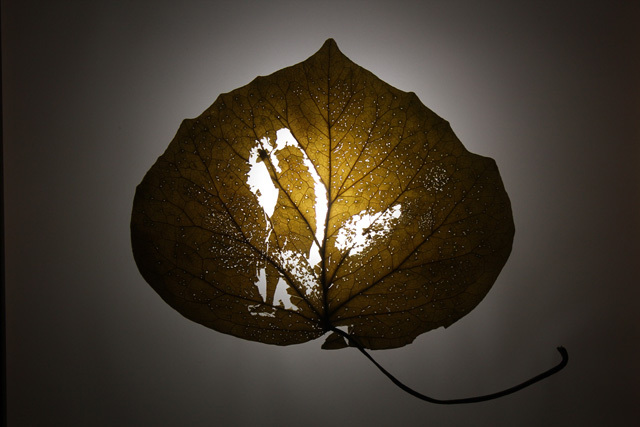 Flora, drawings on various dry and worn leaves that are assembled in light boxes, illuminating the image and evoking infinity, 2011. Photography: Juan Pablo Garay. Introducing Paola Tafur (b. 1982, Neiva, Huila, Colombia; lives and works in Jamundí, Colombia), one of the artists participating in New Poetics of Labor 2018. Tafur’s work is a reflection on the patient and meticulous ways in which she relates to her surroundings. Her practice expresses her personal views regarding the nature of the materials she uses. The cycles of nature, states of decomposition, human intervention, and the disappearance of matter itself act as the fundamental base of her work. A profound understanding of the environment where human beings develop and renew, of the interconnectedness shared by all beings, as well as the cycle of life and death intrinsic to all living things, allow the artist to include references to an organic world abounding with connections. These references include: the passing of time and nostalgia, and short-lived, fragile images rescued in smells, textures and colors — all of which establish connections between the different levels of experiences and memories. “El consumo de las cortezas, las hierbas, las especias me lleva a pensar en las tierras que las han originado, en las travesías y los lugares de destino al que llegan para continuar siendo ingredientes culinarios, medicinales, de investigación o desechos orgánicos. Alimentar y/o curar, dos acciones que han estado presentes en el devenir de la historia humana y reflejan de alguna manera desigualdades territoriales que inciden sobre las interacciones sociales. Así, que la canela, la hoja de parra, la hoja de maíz, los clavos de olor, las especias y los materiales con los que realizo mi quehacer, son capaces de construir por sus características un ambiente artificial insinuante y deleznable. Displacement is an animation where drawing, color and sound are interwoven to tell a real impression about forced displacement, a national phenomenon, a type of violence that locally points to the peasants, the indigenous, and the citizens evicted from their lands through a flower that deteriorates and results in underdevelopment.